When UCLA announced its $4.2 billion goal for the Centennial Campaign for UCLA in 2014, it was the most ambitious target of any fundraising effort initiated by a public university in the United States. Today the campus announced it had surpassed the goal 18 months ahead of schedule. But reaching that milestone doesn’t mean the work is done. 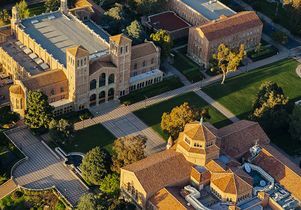 UCLA will continue the campaign through its planned conclusion in December 2019, midway through UCLA’s 100th anniversary year. Campaign funds will further UCLA’s standing as an international leader in groundbreaking teaching, research and service — including state-of-the-art health care — aimed at advancing society and solving some of the world’s greatest challenges. The campus surpassed the $4.2 billion threshold early thanks to a record-breaking 2017–18 fiscal year. During the 12 months ending June 30, UCLA raised $880 million in private support, including $787 million in cash. UCLA’s previous highest total for a single year of fundraising was $664 million in 2015–16, and the campus raised $650 million in 2016–17. More than 95 percent of all campaign gifts and pledges are designated by donors for specific purposes. More than 58,000 donors — including more than 16,000 who gave for the first time — contributed during 2017–18. Ninety-five percent of all gifts and pledges received were less than $10,000. Giving from UCLA alumni totaled a record $233 million. In addition, UCLA received 109 gifts of $1 million or more, which is another campus record. Several UCLA units also experienced exceptional success during the past year. 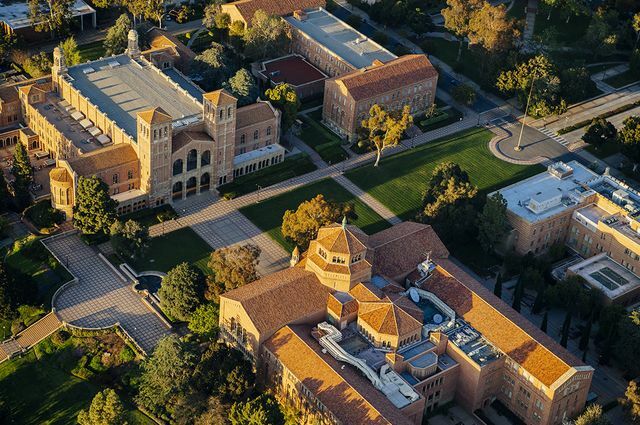 The UCLA College, the academic home for more than 85 percent of UCLA undergraduates, broke fundraising records by raising in excess of $111 million, pushing the College past its own Centennial Campaign goal of $400 million. Contributing to this feat were 26 gifts of $1 million or more in 2017–18, including those from UCLA Professor Emeritus Masamichi Takesaki, who gave $1 million in April to endow a faculty chair in mathematics and later gave another $1.3 million. Across campus, notable gifts during the past fiscal year included $2 million from Mani Bhaumik, who had contributed $11 million earlier in the campaign, to help establish a graduate fellowship in theoretical physics and name a dedicated study and collaboration space for students; $5 million from the Stavros Niarchos Foundation, which gave to establish a center for the study of Hellenic culture; and $300,000 from Leslie W. and Linda L. Koepplin, a gift that was matched by $150,000 from the UCLA Chancellor’s Centennial Graduate Scholars Match, to establish a fellowship in U.S. immigration history. The Hammer Museum at UCLA also enjoyed a strong year, thanks in part to a $30 million gift, the largest in the museum’s history, from Los Angeles philanthropists Lynda and Stewart Resnick. The Hammer Museum is one of three public arts institutions of the UCLA School of the Arts and Architecture that serve as valuable resources for scholars, artists, students and the broader UCLA community. The UCLA Fielding School of Public Health received $2 million to establish the Jean Balgrosky and Parker Hinshaw Fellowship, which supports students from challenging situations or who demonstrate financial need and are the first in their families to pursue an advanced degree. In addition, the UCLA Herb Alpert School of Music received $1 million from Farhang Foundation to create a new minor in Iranian music. The minor will build on the department of ethnomusicology’s revitalized Iranian music program, which was brought back in 2016 with institutional and donor support after a 20-year hiatus. Among the priorities for the remainder of the campaign will be to increase scholarship support for students from low- and middle-income families. Currently, more than half of UCLA undergraduate students receive financial aid, and 35 percent of UCLA undergraduate students receive Pell Grants — federal aid for low-income students — among the highest percentage of any top-tier university in the country. To answer this need, Block initiated the UCLA Chancellor’s Scholars Match in 2016. UCLA also will continue to bolster support for major campuswide efforts, including the Depression Grand Challenge and the Sustainable LA Grand Challenge. The Centennial Campaign has enabled UCLA to increase the number of endowed faculty chairs, to nearly 500 overall. During 2017–18, Ralph and Shirley Shapiro and their family gave to support four endowed chairs at the David Geffen School of Medicine at UCLA to advance children’s health. The Shapiro Family Charitable Foundation also donated to the UCLA School of Nursing to endow a faculty chair in developmental disability studies. In addition, Sidney Kimmel, inspired by the work of UCLA’s Dr. Ronald W. Busuttil and his team, gave $5 million to establish the Sidney Kimmel Endowed Chair in Transplantation Surgery. Rhea Turteltaub, UCLA vice chancellor for external affairs, noted that of the more than 188,000 donors who have contributed to the campaign, 48 percent have been from Los Angeles County. Anthony and Jeanne Pritzker contributed gifts totaling nearly $60 million to fund a variety of initiatives, including arts programs and efforts to strengthen families and improve the environment. Building on his support during past campaigns, David Geffen gave $100 million to establish the Geffen Academy at UCLA, which opened in fall 2017 and serves students in grades 6 through 12. Geffen also gave $100 million for scholarships to cover the entire cost of education for some of the very best medical students at the Geffen School of Medicine. UCLA graduates Renee and Meyer Luskin gave $100 million to improve academic offerings and support capital projects, including the UCLA Renee and Meyer Luskin Conference Center, which opened in 2016. The Luskins’ overall campaign giving is nearly $109 million. Henry and Susan Samueli, through the Samueli Foundation, gave $20 million to the UCLA Samueli School of Engineering to attract undergraduate students from underrepresented backgrounds to study engineering and computer science. In 2016, the Samueli Foundation contributed $10 million to UCLA to match other donors’ gifts and create new endowed faculty chairs in engineering, as well as support the school’s planned growth. The Samuelis have given more than $50 million total to the campaign. Henry Samueli is the campaign’s Orange County chair. UCLA received $20 million from the Parker Institute for Cancer Immunotherapy. UCLA is one of seven academic centers that make up the institute, whose mission is to accelerate the development of breakthrough immune therapies and turn cancer into a curable disease. “The Big Bang Theory” co-creator Chuck Lorre and the show’s cast and crew gave more than $4 million to establish The Big Bang Theory Scholarship, which supports UCLA students pursuing degrees in science, technology, engineering and mathematics. In 2015, philanthropist Marion Anderson, whose late husband, John, is the namesake of the UCLA Anderson School of Management, gave $100 million to establish an endowment to support student financial aid, fellowships and other priorities, and to help fund a new building at the school, which will stand as a lasting tribute to Anderson, who passed away in 2017. The Centennial Campaign is led by Turteltaub and UCLA’s associate vice chancellors for development, Kathryn Carrico and Laura Lavado Parker. Aerial view of UCLA’s Dickson Plaza, including Royce Hall (top left) and Powell Library (bottom center).